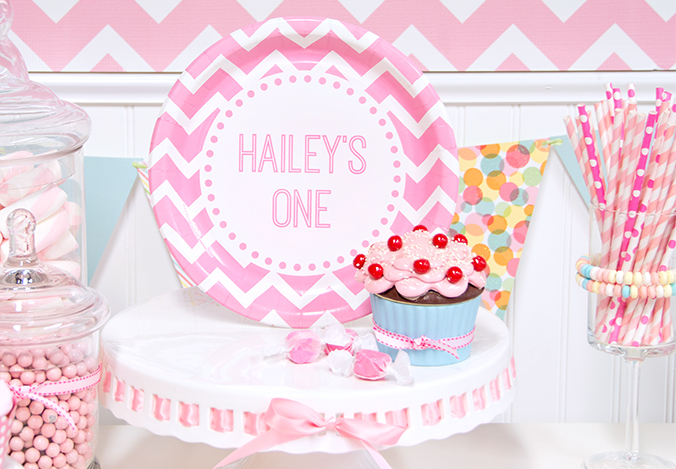 Chevron party supplies are a totally trending party theme right now, which makes them perfect for kids of all ages. 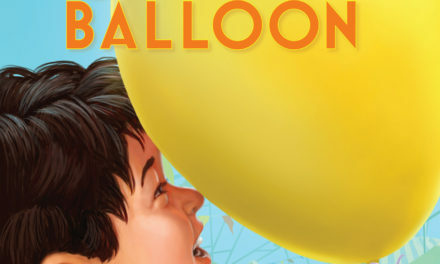 Whether you’re looking for toddler or tween birthday party ideas, it’s a great place to start. That’s why we’ve come up with this gorgeous pink party theme for girls (there’s also a blue one for boys, but more on that later). 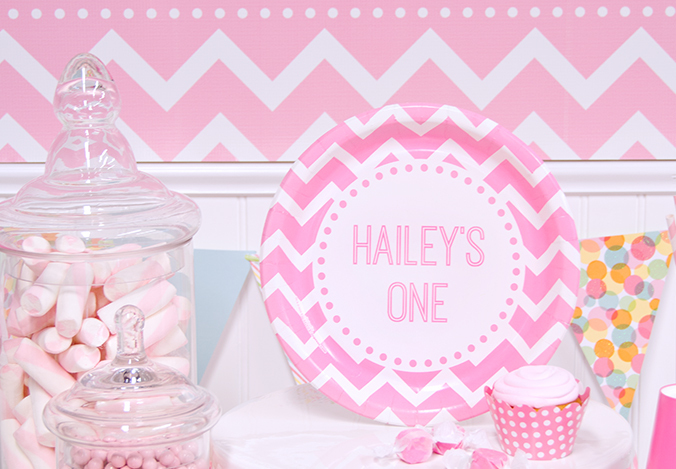 Keep on reading to discover our styling and decorating tips for this pink chevron birthday theme! One of the best parts about chevrons is that they can enhance boring solid colors into something special and memorable. 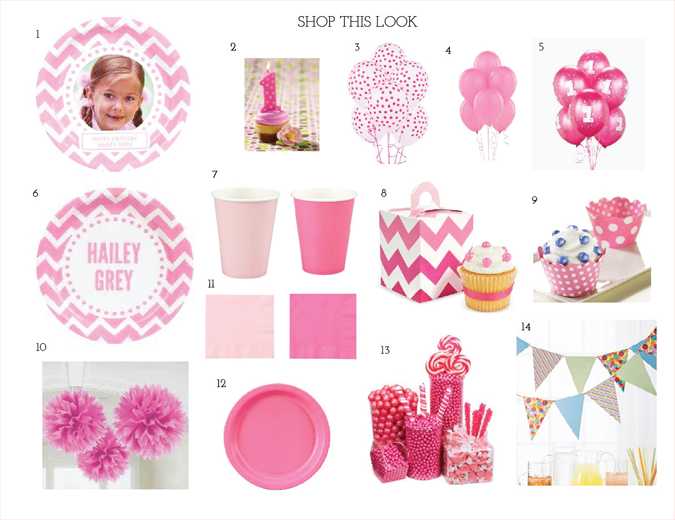 Here, we’ve layered together a couple different styles of solid pink party supplies to start building up the look. Classic pink is the lighter, bubblegum shade, and candy pink is the brighter style underneath. Cups and striped straws are placed to match them. These colors are definitely great on their own, but when the chevron party supplies are given center stage (or rather, center table), it really transforms into a totally unique party theme. The best part about this birthday party theme, though, is that it’s completely customizable, and the personalization process for our party supplies couldn’t be simpler. All you have to do is to click on the “personalize now” buttons on any applicable product page to open up our in-browser personalization app. From there, it takes mere seconds to design your own party supplies with a photo of your child and a custom message. 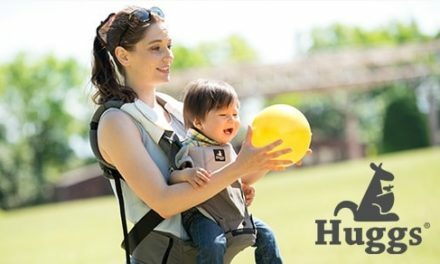 When you’re finished, you’re right back to shopping. This can be done with every item in this party theme from plates to special birthday banners. Click here to read more about how personalization works with our most popular birthday themes. Every birthday party needs a selection of sweets! 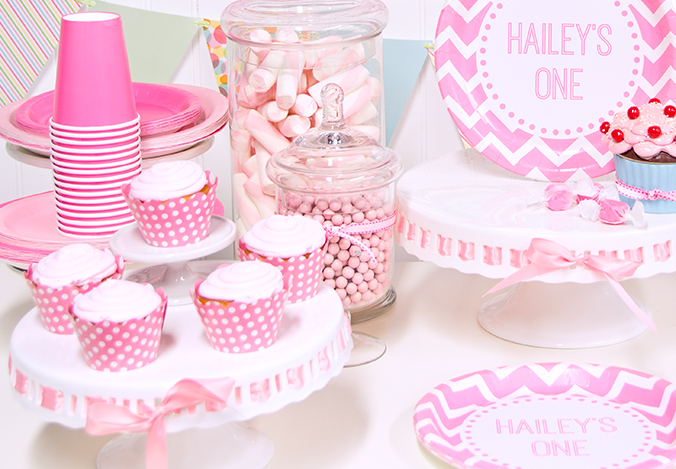 Pink polka-dotted cupcake wrappers and pink Sixlet candies can dress up a plate of vanilla cupcakes easily. The Sixlets also look great by themselves when displayed in a glass jar tied with pink ribbon, and you can use the same ribbon to tie around the cake platter itself, too. A colorful pennant garland is a great way to add a little contrast to the scene and break up the pink a little bit. You can also always try mixing in other colors of chevron party supplies, or other colors of hanging decorations like crepe paper or paper lanterns. Click inside this graphic to shop the pink chevron look for your loved one’s next birthday! Aside from the party supplies, don’t forget about adding special extra decorations like giant tissue paper puffs and polka-dot balloons. 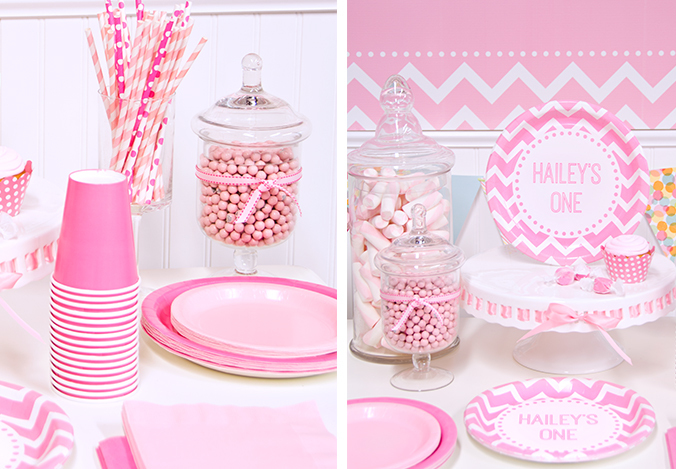 Have we inspired you to make your child’s next birthday party pretty in pink? What was your favorite birthday party theme when you were a kid? What kind of birthday party ideas should we come up with next? If you liked this post and want to see more like it, then let us know! Connect with us on Facebook and Twitter @BirthdayExpress to share your thoughts and party pics, or send us a quick email. Be sure to check out the rest of our birthday party ideas and inspiration on our Pinterest boards.